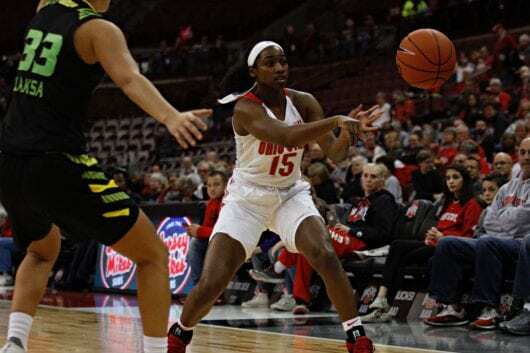 The Ohio State women’s basketball team gained its third victory of the season and second in a row after defeating the Cincinnati Bearcats 69-56 on Sunday. The Buckeyes got off to a hot start with a 15-4 lead midway through the first quarter, making six of seven from the field and three of four from 3-point range to start the game, one of which was a milestone 3 from redshirt senior guard Adreana Miller. Miller recorded her 1,000th career point on a 3 ball, helping Ohio State to the highest scoring quarter of the season, scoring 26 points to pair with a season high 85 percent shooting for a quarter. The Buckeyes carried their momentum into a 17-point lead at halftime powered by freshman forward Dorka Juhasz’s game-high 10 points and seven rebounds. The second half turned into a much more competitive affair as the Bearcats chipped away against Ohio State behind the strength of a team-high 14 points by junior guard Sam Rodgers, who played a game-high 37 minutes. The Buckeyes made many mental mistakes and had missed opportunities that allowed Cincinnati to get back into a game that head coach Kevin McGuff said should have been wrapped up earlier. Cincinnati narrowed the lead to just three points in the second half when the Bearcats went on an 11-0 run. Comparably, Ohio State was unable to find its scoring touch, going more than five minutes without a basket. While Ohio State’s 19 turnovers illustrated the mental breakdowns during the game, the team was able to stay resilient and end the game on a 10-0 run highlighted by two 3-point shots off the bench by junior guard Jensen Caretti. The Buckeyes (3-2) next face the Washington Huskies (4-3) on the road Wednesday.